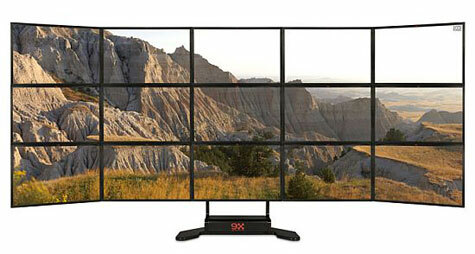 9XMedia offers you to spread your horizons as much as you can think of with their multi-screen display systems that are expandable and customizable. Their catalogue (featured here is a 15 screen multi-display) includes up to 30-screen triple row scalable ergonomic multi-monitor display solution available with customized Multi-screen servers and optional upgrades and software. The X-Top Scalable Multi-Screen Display System made it’s debut in 2001 at the Siggraph tradeshow in Los Angeles, California. It quickly became the gold-standard of Multi-Screen desktop displays and today it continues to define and set the standard for multiple monitor innovation. The X-Top’s expandable and ergonomic patent-pending structure enables 1000’s of configurations ranging from 1 to 3 rows with 2 to 64 integrated screens. Our SlimLine LCDs feature world-class specs in the world’s only display designed to dramatically enhance Multi-Screen tiling and viewing.